Wow, this challenge is really keeping me on my toes to follow through. But like I said before, I need this motivation to get things done and transition from my "lackluster design contentment" to "wow, I actually put some effort in to make this space feel and function with design intention." I really do love to be organized... And, I really do love to be in an aesthetically pleasing environment. The thing is, life just gets in the way sometimes, and other times, I just become complacent. I have a full family life with my husband and 3 sons, I work fixing up and building homes, I try to exercise and be healthy, I'm involved in church, I try to have a social life and sometimes, like last weekend, I get sick. Blah! Just a minor setback. But, thanks to this challenge, I'm on my feet again and dreaming up how to transform this messy, bland office of ours. Just a reminder, and in case you didn't see the before pics, here is what our office looked like last week. If you want to see more before pics you can go to my post about Week 1. If you want to see my design inspiration, you can click on Week 2. But I say, to heck with that, lets just move forward. So, Friday afternoon, the day before the head cold slammed me into bed with boxes of tissues, I was able to get the office painted. I went with Sherwin Williams "Cascades." I am absolutely in LOVE with it! My husband, who I share this office with, still isn't so sure about it... He says that it's growing on him, which is definitely a move in the right direction. I think once all the details are pulled together, he'll approve. Doesn't it look SO good with my black walnut desk? Here is another photo. Notice how the light really reflects different hues in the paint. In the bright daylight, the color looks green, but in the evening it is more blue. Either way, I'm smitten. Speaking of smitten... 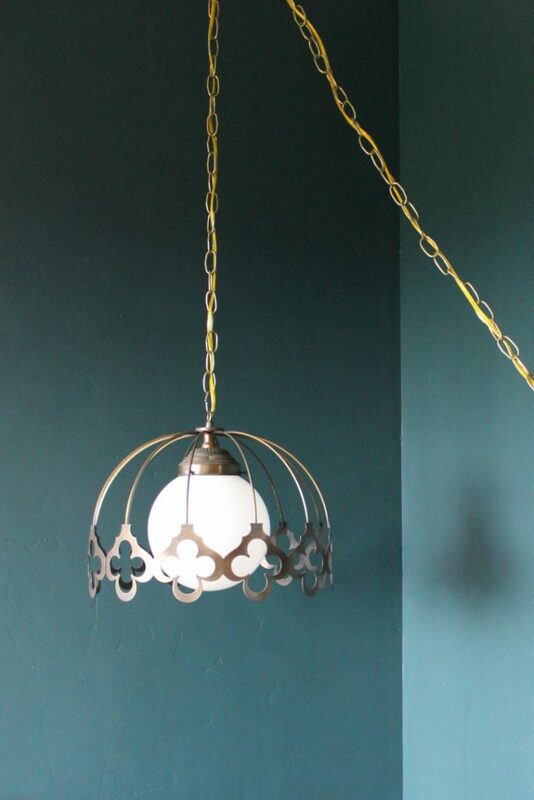 I've been hoarding this "granny chic" pendant light for over a year now(maybe 2). I had no idea what I was going to do with it when I purchased it... Or, them. I actually have 2. One may think that I'm a little crazy for picking these up at the thrift store, but I think they're pretty rad. Have a look for yourself... I think I took 80 pictures of the thing today. Still not sure on placement of it, I have some desk re-configuring to do next week that will help me determine the final location of this gem. I love how the dark wall really makes it stand out. Can you imagine if it was against a white wall? I just don't think it would have the same pizazz. So, really... I didn't get much done last week. But, I did come to some conclusions about my ideal "budget" makeover plan. Some of my wishes had to get crossed off the list for now. Namely the desire for new flooring in the office. That's the one thing that I really DISLIKE about the space. The carpet is just cheap and ugly. When we built the house, we really scrimped in the carpet department. Partially because we just needed to cut costs at the end, and partially because we live in the high dessert with kids and pets, etc... It is SUPER dusty and dirty here. One rule that I've been abiding by for the last 16 years is this... If we're going to have carpet, it's going to be the color of dirt. True story. I'm just that practical. Now don't get me wrong, I LOVE area rugs, and I even have an off-white shag area rug in my living room. But somehow, in my quirky mind, that seems ok. Anyway, I've come to terms with the fact that I'm not ready to pull the ugly carpet yet... It's just not in our budget right now. But I did come up with a solution for the time being that I'm pretty happy about. This area rug! I bought this 8'x10' kilim area rug at the thrift store for $60 last year... What a score! Just like the lamps, I wasn't sure what I was going to do with it. It is in pretty good shape, but doesn't match any of the decor in the other rooms of our house. So, I'm pretty pumped that it fits perfectly in the office and covers most of the ugly carpet. 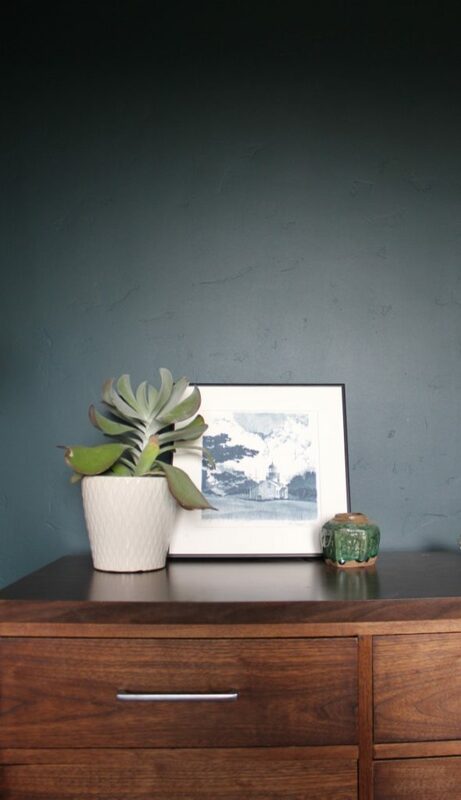 The colors are warm and it helps to soften up the look of the office. It's a great solution for now. Ok, so my goal for this coming week is to build the shelves and art ledges from some walnut wood that I have left over from a remodel that I did last May. I'm really pacing myself through this project because I really only have the weekends to work on it. If you guys want to see some BIG-TIME room makeovers, head over to Linda's page at Calling it Home and check out the amazing work of other designers and bloggers as they attack a room of their own, or client's in 6 weeks and share about their process and transformations.